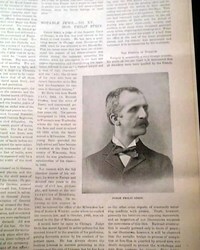 Offered is an original, historic, & collectible old newspaper: FRANK LESLIE'S ILLUSTRATED, July 20, 1893 Of special interest is item #XV of "Notable Jews - Hon. Philip Stein" which also includes a photograph & biography of him. Among many other prints & photos is a full ft. page: "Recent Appalling Calamity on the Grounds of the Columbian Exposition at Chicago" showing a building on fire; a full pg. with 2 photos of: "Two New Cup Defenders, the 'Jubilee' and the 'Vigilant' ". and a doublepg. centerfold with 9 photos of: "Independence Day at the Columbian Exposition at Chicago". Sixteen pages, very nice condition. Shown is an original & historic old newspaper, offered to enhance your collectible interest: FRANK LESLIE'S ILLUSTRATED, July 6, 1893 * Czech Jewish-American physician Of special interest is item #IV of "Notable Jews - Dr. Joseph Lewi" which also includes a photograph & biography of him. 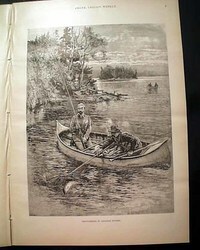 Among many other prints & photos is a full page: "Trout Fishing In Canadian Waters", a montage of 11 photos of: "The Season of Summer Outings" in the Adirondacks, Narragansett, Lake George, & more. Sixteen pages, very nice condition. 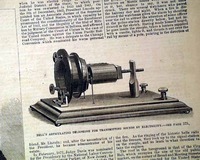 Shown is an original & historic old newspaper, offered to enhance your collectible interest: FRANK LESLIE'S ILLUSTRATED, New York, Aug. 31, 1889 The full ftpg. 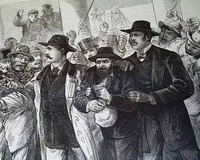 is a nice print: "At Lake George Landing--Saluting the Passengers". 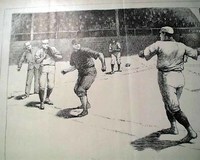 But likely the most significant print is a great full page: "A Base-Ball Incident--Caught Between The Bases" which shows a player caught in a rundown. Other good prints include a half page: "Gioca Di Bocci--Summer Afternoon Scene at an Italian Resort on Staten Island", a rare print showing the sport of Bocce Ball; a great fullpg. 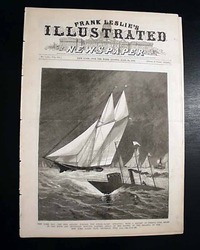 print: "Fishing In The Adirondacks" "The Insurrection in Honolulu, Sandwich Islands--The Royal Hawaiian Palace" & more. Sixteen pages, very nice condition. 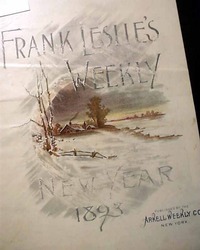 Shown is an original & historic old newspaper, offered to enhance your collectible interest: FRANK LESLIE'S ILLUSTRATED, New York, May 5, 1883 * Georgetown CO Colorado * Tacoma WA Washington Territory The full ftpg. shows: "Sketches at the Irish Land League Convention...Philadelphia". Inside has prints of: "Washington Territory--View of Tacoma, Terminus of the Northern Pacific Railroad on Puget Sound"; the doublepage centerfold is a dramatic scene of a mother at the Tombs jail (see); half page: "The Indian at Work--Maple Sugar Making in the Northern Woods" and "Iowa--Scene at Danbury during the Terrific Tornado...". Also a nice quarter page print of: "Colorado--The Mining City of Georgetown, in Clear Creek Canyon". Sixteen pages, very nice condition. 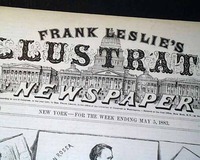 Shown is an original & historic old newspaper, offered to enhance your collectible interest: FRANK LESLIE'S ILLUSTRATED, New York, Dec. 3, 1881 * President James Garfield assassination * Charles J. Guiteau on trial The full ftpg. 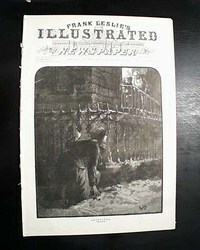 shows: "Trial of President Garfield's Assassin--Guiteau Being Escorted from the Courtroom..." and the doublepage centerfold shows; "Trial of President Garfield's Assassin--Guards Unlocking the Handcuffs of the Prisoner..."; a fullpg. with 4 prints: "On the Eve of the Thanksgiving Feast--Hunting the Wild Turkey", a small print of: "J. Howard Welles, Blackmailer of Jay Gould." Sixteen pages, very nice condition. 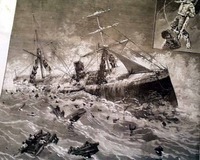 Shown is an original & historic old newspaper, offered to enhance your collectible interest: FRANK LESLIE'S ILLUSTRATED, New York, Jan. 26, 1884 * SS City of Columbus shipwreck disaster The full front page shows: "The Wreck of the Steamship 'City of Columbus' On the Rocks Off Gay Head...". 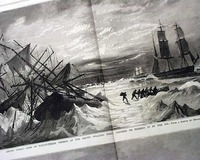 Inside has: "Pennsylvania--Terrible catastrophe near Bradford...a Railway passenger train engulfed in burning oil..."; a half page with four: "Views in Alaska & the Behring Sea..."; a one-third pg. scene: "California--Reception & Parade in Honor of General Hancock, in Los Angeles". Sixteen pages, nice condition. 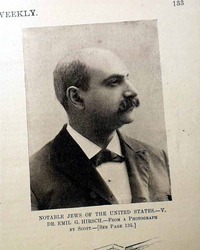 Shown is an original & historic old newspaper, offered to enhance your collectible interest: FRANK LESLIE'S ILLUSTRATED, March 2, 1893 * Emil G. Hirsch * Reform movement rabbi * Mardi Gras - New Orleans Of special interest is installment #5 of "Notable Jews - Dr. E. G. Hirsch" which also includes a photograph of him on a preceding page. This is a series which ran in Leslie's for much of the year (others available: inquire). 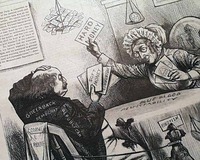 Other prints include "...Annual Skating Championship Races on the Shrewsbury River, New Jersey" "The Birthplace of President Cleveland at Caldwell, New Jersey", several prints of the fire department at the Columbian Exposition, several prints of the "Mardi Gras Celebration" in New Orleans, plus more. Sixteen pages, very nice condition. 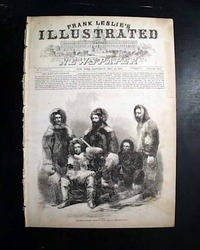 Shown is an original & historic old newspaper, offered to enhance your collectible interest: FRANK LESLIE'S ILLUSTRATED, New York, Feb. 2, 1893 A great issue for skiers as the full ftpg. 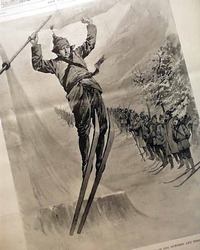 shows: "Winter Sports in the West--Flying On Skis--Thorger Hemmestvedt's Great Jump of 103 Feet at Red Wing, Minnesota". Red Wing is the birthplace of America ski-jumping (see hyperlink). Inside has an interesting full page: "Shall We Restrict Immigration? Specimen Types of Constantly Arriving Immigrants at Ellis Island". A fullpg: "Obsequites of the Late Ex-President Rutherford B. Hayes at Fremont, Ohio" "The Gambling Evil--Scenes in the Pool Rooms of New York", a photo of: "Ignace Paderewski, the Famous Pianist" and more. Sixteen pages, great condition. 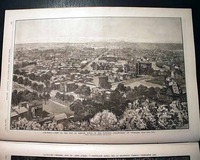 Shown is an original & historic old newspaper, offered to enhance your collectible interest: FRANK LESLIE'S ILLUSTRATED, New York, July 28, 1883 * Early Denver, Colorado The most notable print would be the very nice full page print captioned: "Colorado--View of the City of Denver..." which is a great overview of the city at that time. Other prints include: "New Mexico--The Tertio-Millennial Celebration at Santa F: A Group of Indian Clowns" "The International Rifle Match at Wimbledon" "Colorado--Grand Canyon on the Arkansas--The Royal Gorge" "New Hampshire--Summer Pleasures in the White Mountains" and more. Sixteen pages, very nice condition.